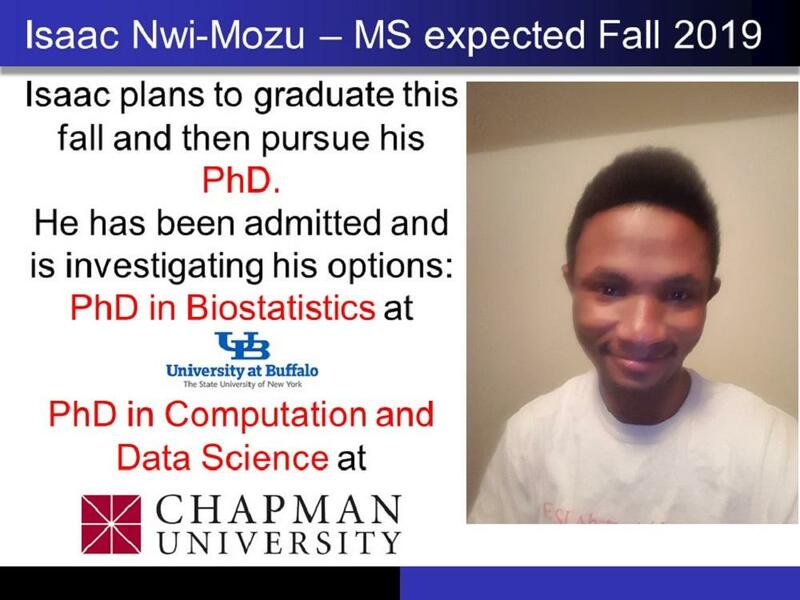 Our students are doing amazing things! 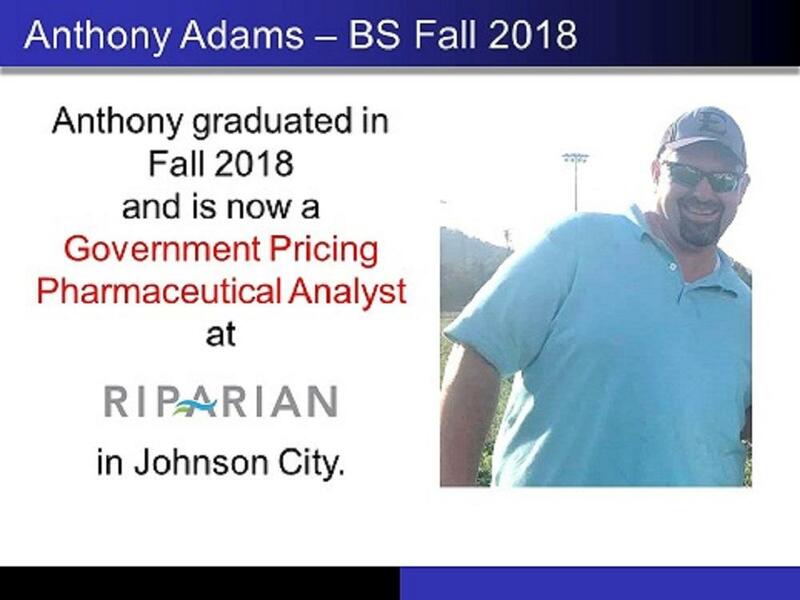 Anthony graduated in Fall 2018 and is now a Government Pricing Pharmaceutical Analyst at Riparian in Johnson City. 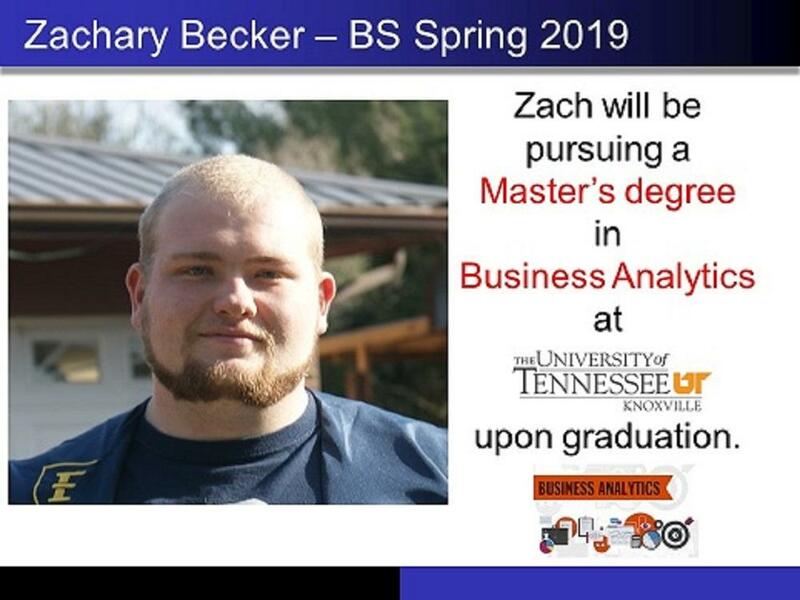 Zach will be pursuing a Master’s degree in Business Analytics at the University of Tennessee upon graduation. 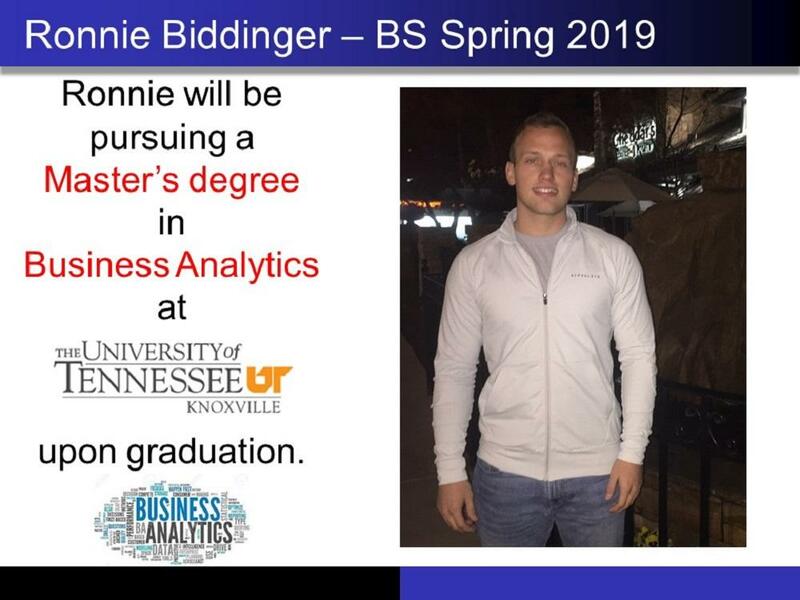 Ronnie will be pursuing a Master’s degree in Business Analytics at the University of Tennessee upon graduation. 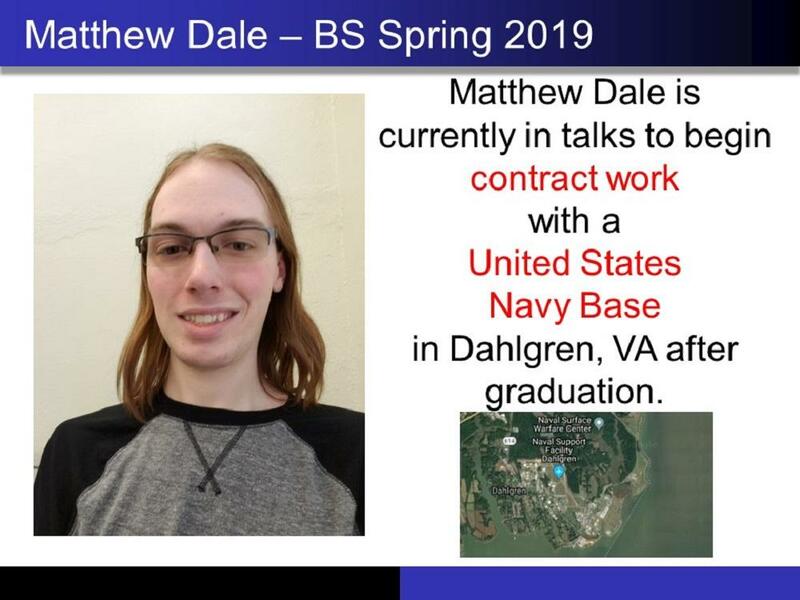 Matthew Dale is currently in talks to begin contract work with a United States Navy Base in Dahlgren, VA after graduation. 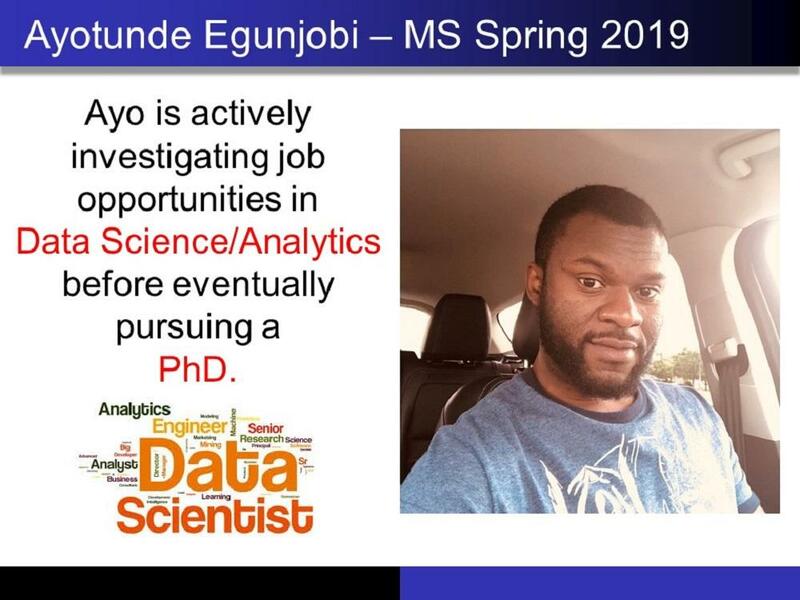 Ayo is actively investigating job opportunities in Data Science/Analytics before eventually pursuing a PhD. 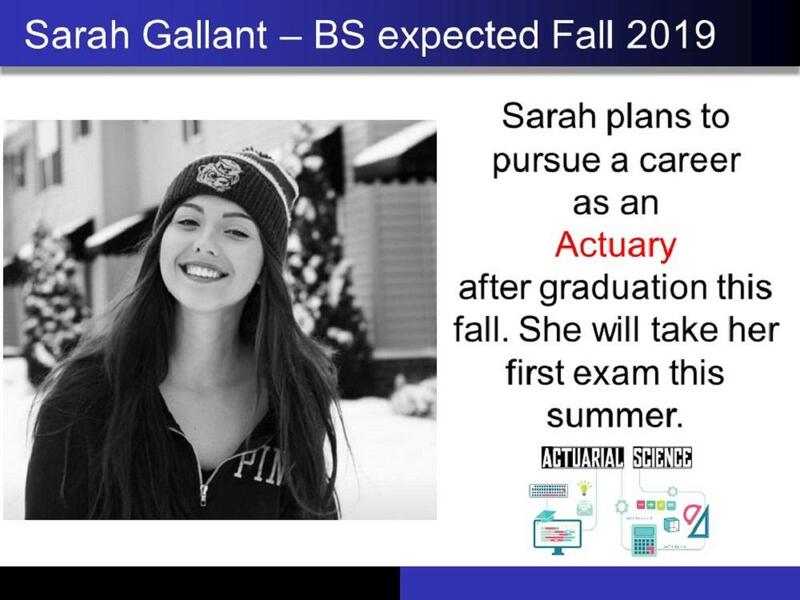 Sarah plans to pursue a career as an Actuary after graduation this fall. She will take her first exam this summer. 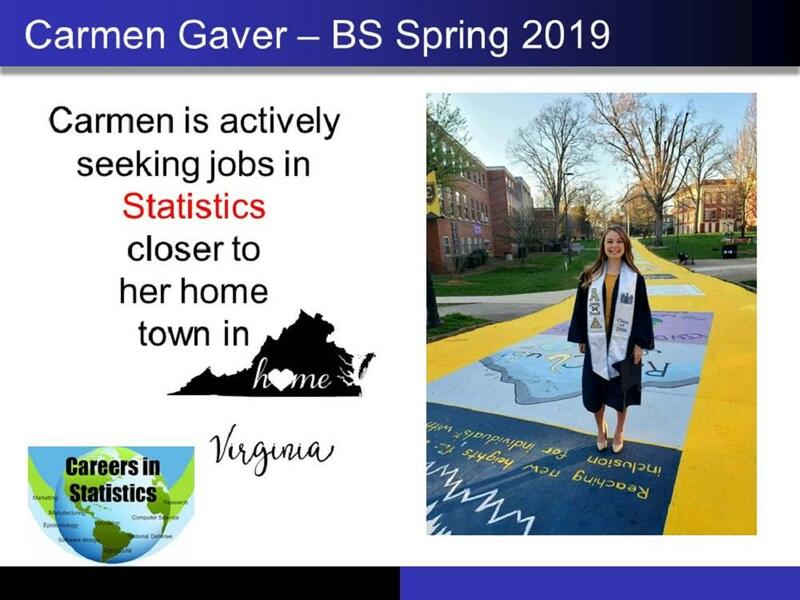 Carmen is actively seeking jobs in Statistics closer to her home town in Virginia. 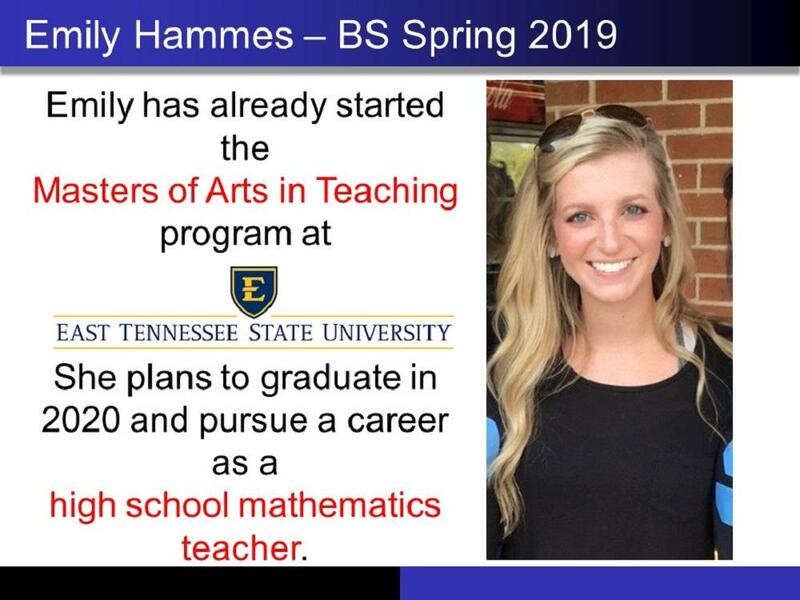 Emily has already started the Masters of Arts in Teaching program at ETSU. She plans to graduate in 2020 and pursue a career as a high school mathematics teacher. 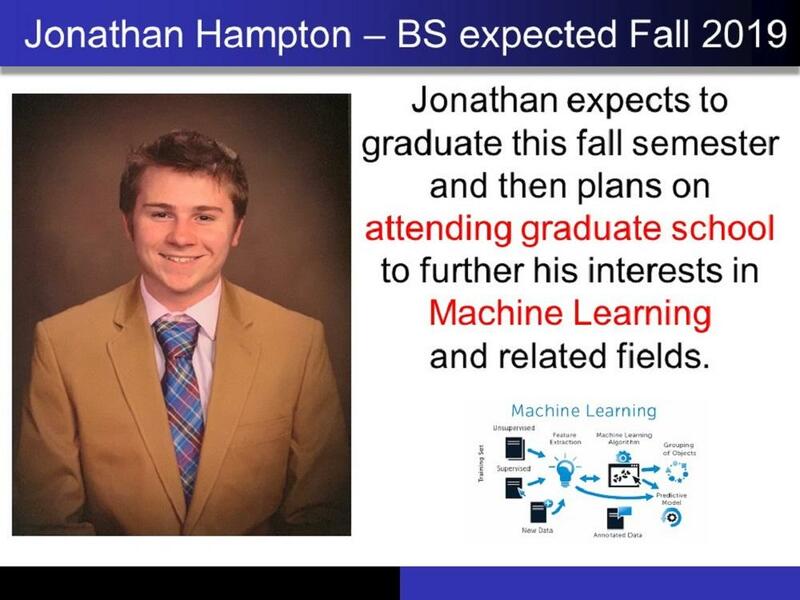 Jonathan expects to graduate this fall semester and then plans on attending graduate school to further his interests in Machine Learning and related fields. 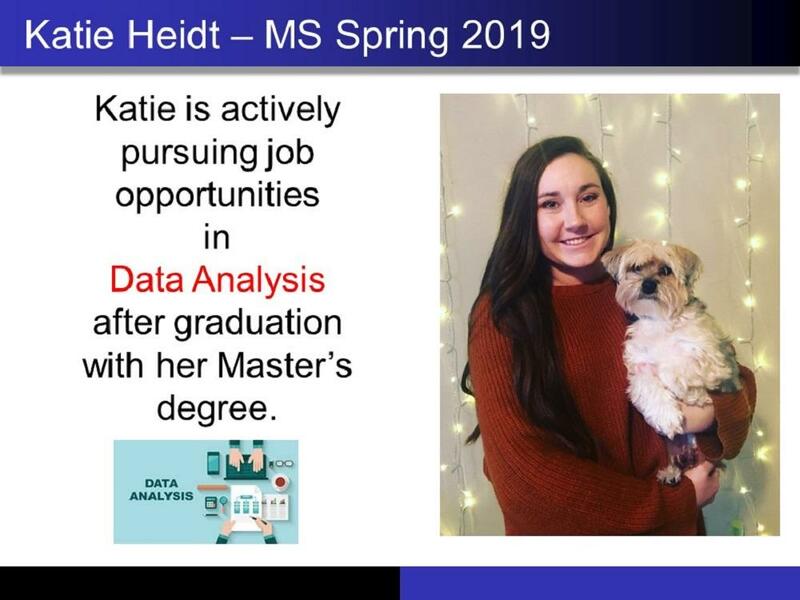 Katie is actively pursuing job opportunities in Data Analysis after graduation with her Master’s degree. 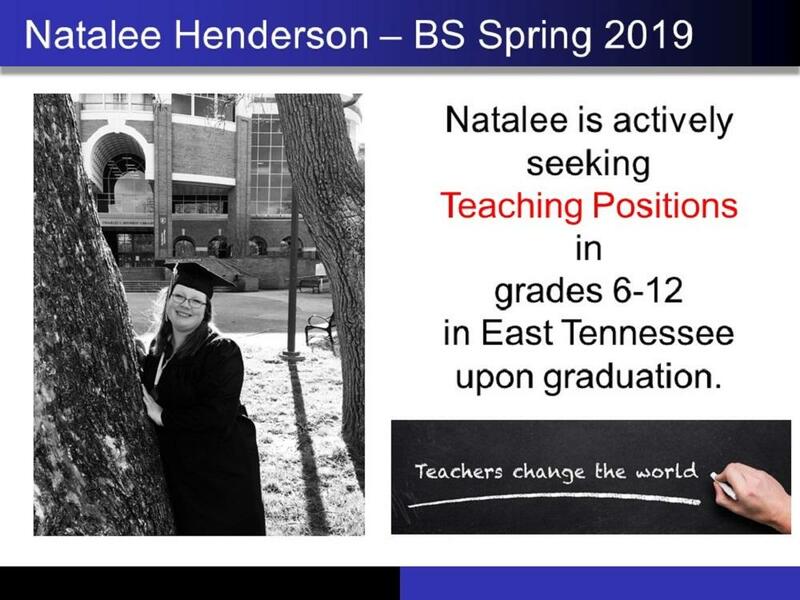 Natalee is actively seeking Teaching Positions in grades 6-12 in East Tennessee upon graduation. 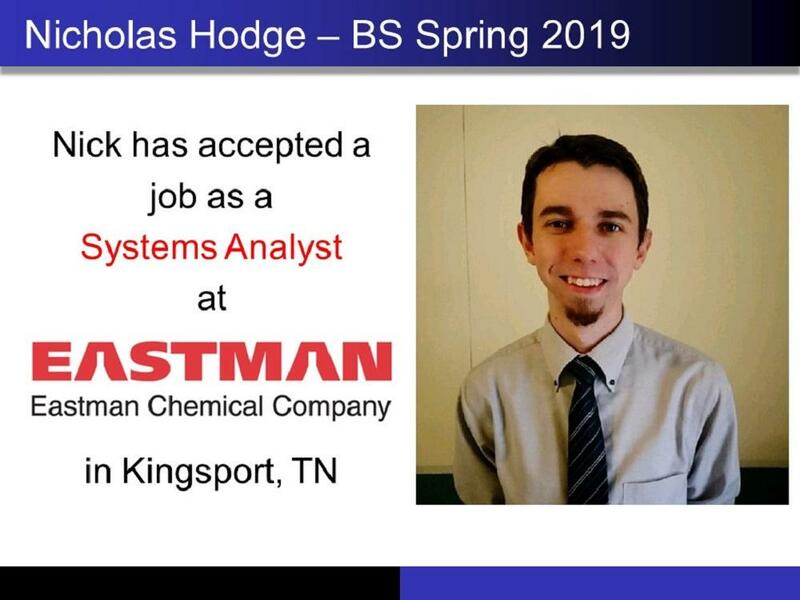 Nick has accepted a job as a Systems Analyst at Eastman in Kingsport, TN. 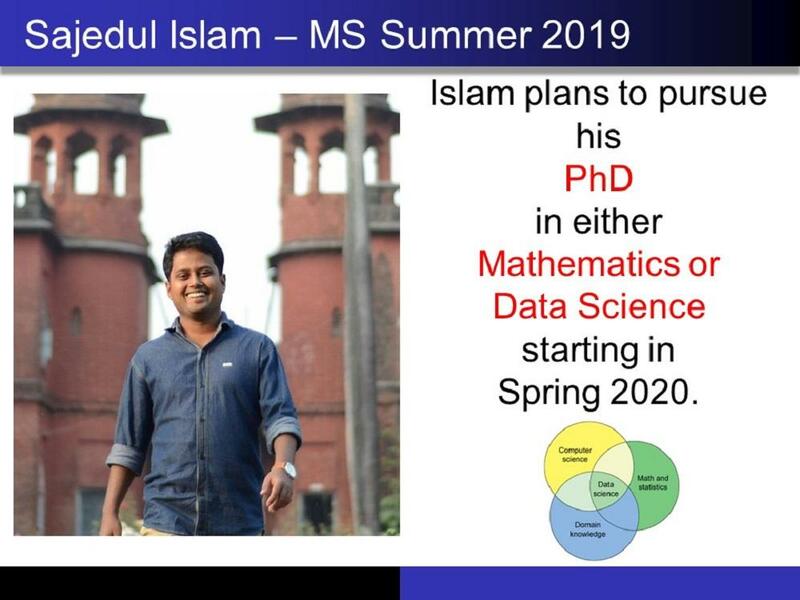 Islam plans to pursue his PhD in either Mathematics or Data Science starting in Spring 2020. 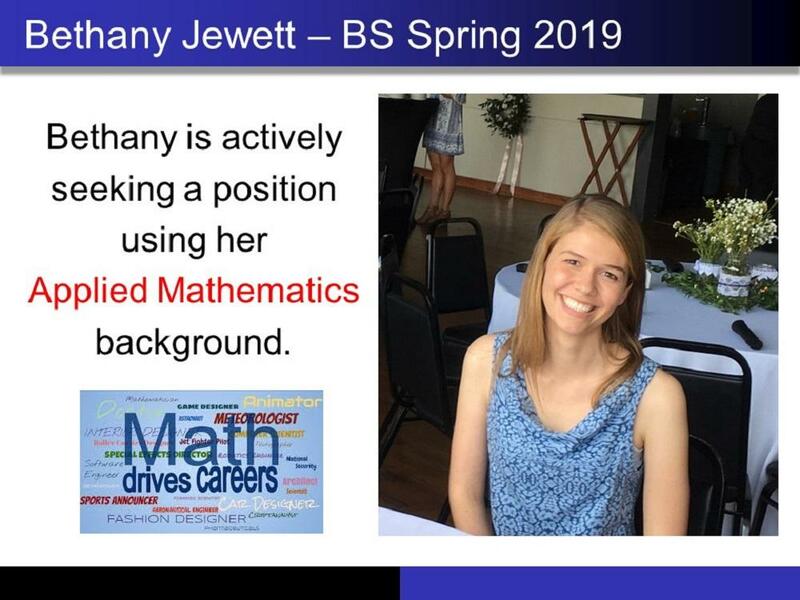 Bethany is actively seeking a position using her Applied Mathematics background. 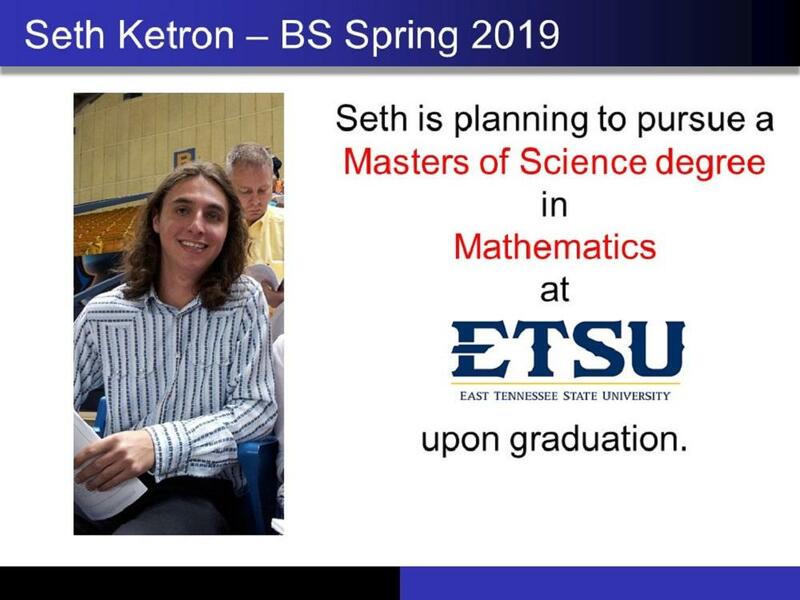 Seth is planning to pursue a Masters of Science degree in Mathematics at ETSU upon graduation. 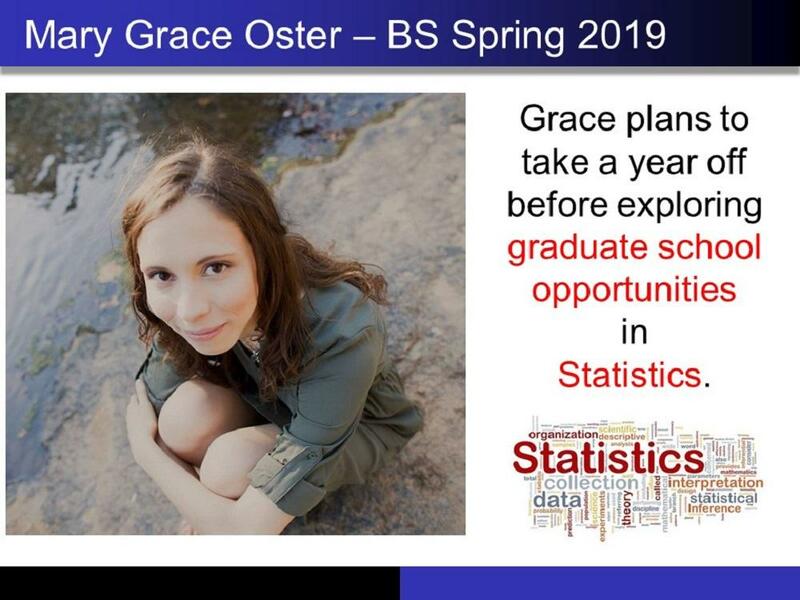 Grace plans to take a year off before exploring graduate school opportunities in Statistics. 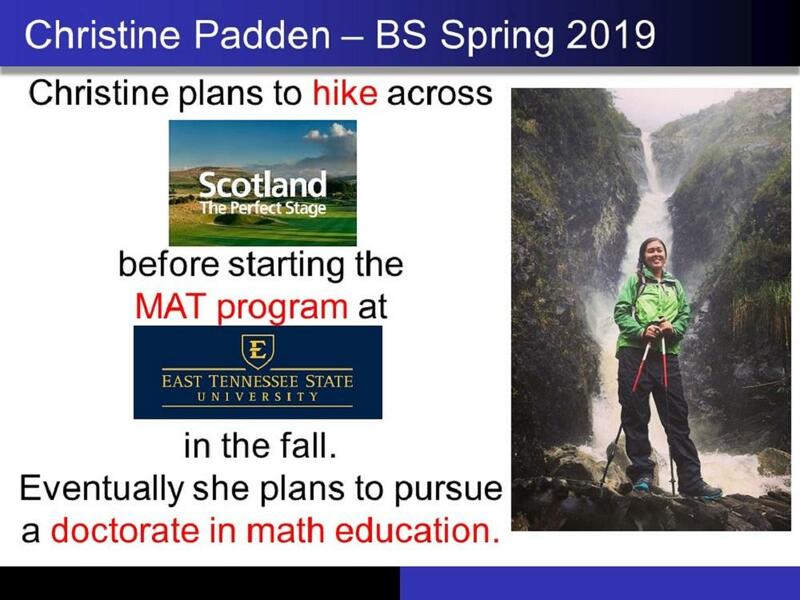 Christine plans to hike across Scotland before starting the MAT program at ETSU in the fall. Eventually she plans to pursue a doctorate in math education. 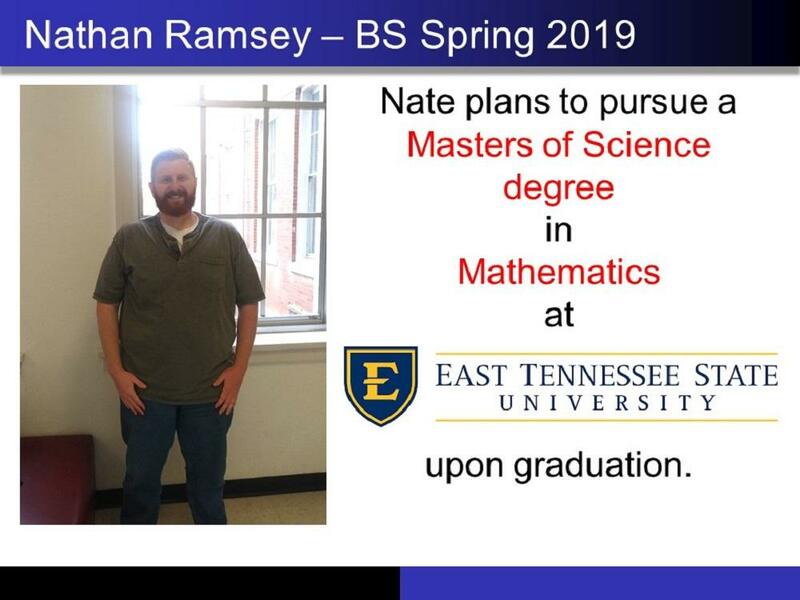 Nate plans to pursue a Masters of Science degree in Mathematics at ETSU upon graduation. 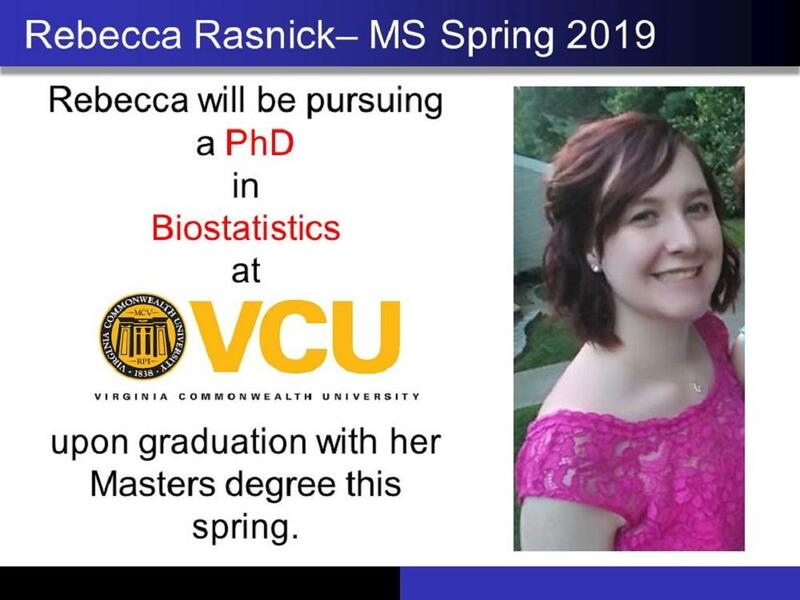 Rebecca will be pursuing a PhD in Biostatistics at Virginia Commonwealth University upon graduation. 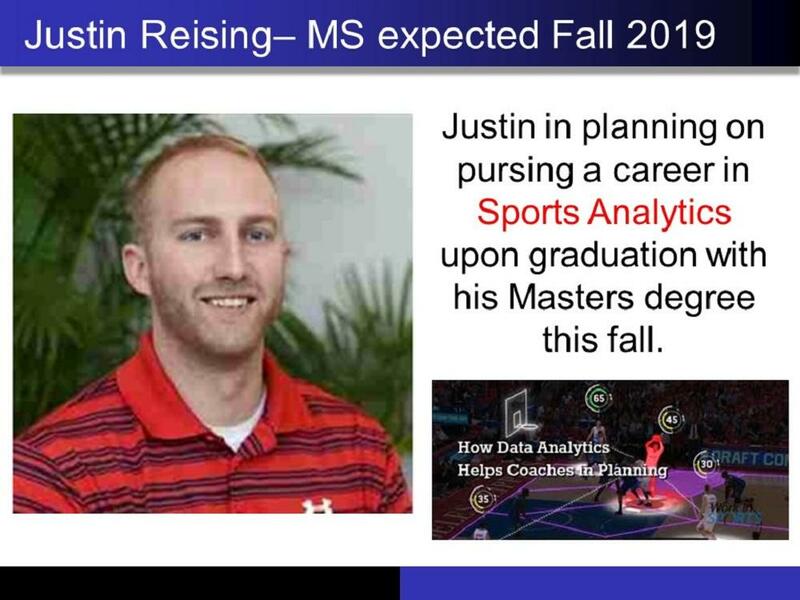 Justin in planning on pursing a career in Sports Analytics upon graduation with his Masters degree this fall. 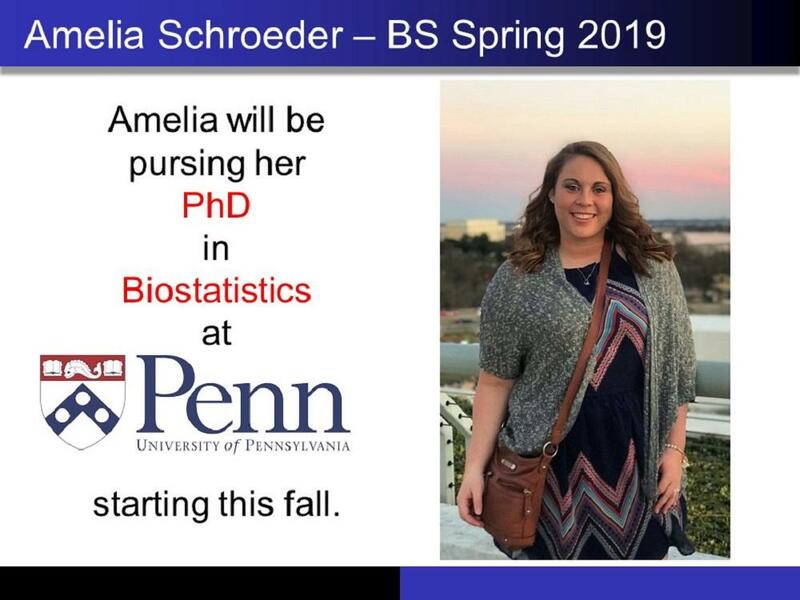 Amelia will be pursing her PhD in Biostatistics at the University of Pennsylvania starting this fall. 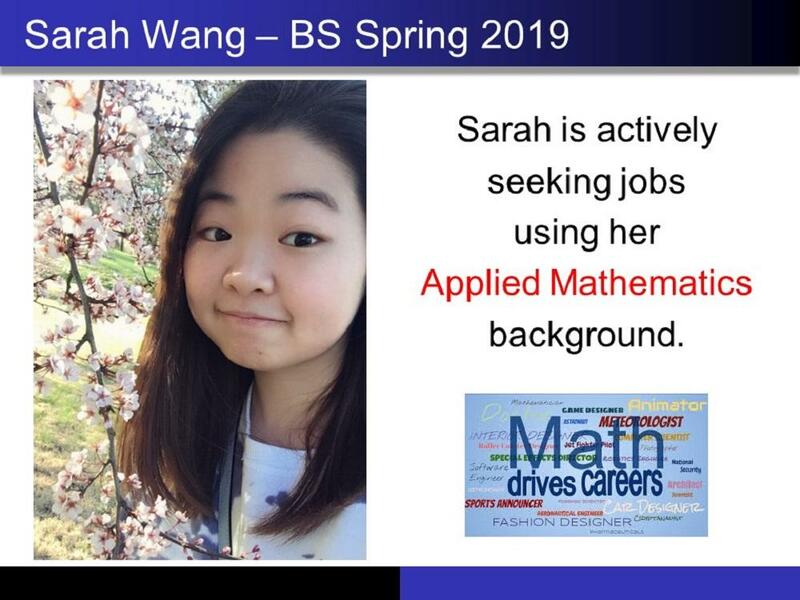 Sarah is actively seeking jobs using her Applied Mathematics background. 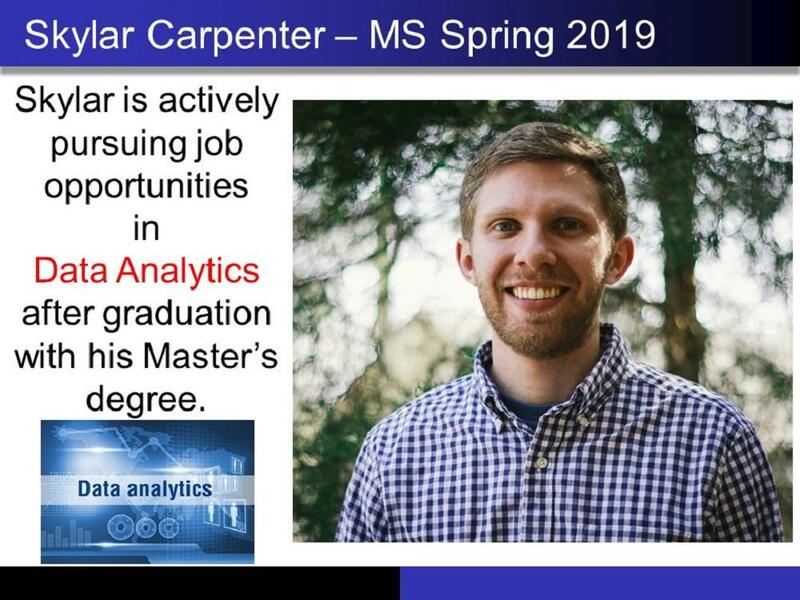 Skylar is actively pursuing job opportunities in Data Analytics after graduation with his Master’s degree. Notable Activities of Our Faculty! Dr. Michele Joyner is the principal investigator of a PIC Math course (Preparation for Industrial Careers in Mathematical Sciences) at ETSU. PIC Math is a joint Mathematical Association of America and Society for Industrial and Applied Mathematics program funded by the National Science Foundation (NSF grant DMS-1345499). Amelia Schroeder won the 2018-19 Outstanding Undergraduate in Mathematics Award. Bethany Jewett won the 2018-19 Faculty Award for Outstanding Undergraduate Student. Skylar Carpenter and Ayotunde Egunjobi received the 2018-19 Outstanding Graduate Student Award.